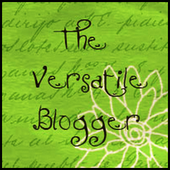 I had a nice surprise yesterday when I found out I'd been nominated for The Versatile Blogger by Rebecca Leith. Her blog has author interviews and lovely, thoughtful posts on writing and things of interest. Next, select 15 blogs/bloggers that you've recently discovered or follow regularly (I'd pick blogs or bloggers that are excellent!) If it's a bit of a task to list 15, and I don't want you to feel being nominated is a burden, but mention as many as you can - 8 or 10 is fine. List them, and you might like to include a link to the sites, and let them know that you've nominated them. And tell the person who nominated you seven things about yourself. I am one of five; I'm the baby and my sister is the oldest with three brothers in the middle. My Great Uncle was the mayor of the town I'm from and the local swimming pool is named after him. I was once a vegatarian. I lasted almost four years until the lure of chippy gravy and Hollands meat and potato pies grew too much. I reverted back four days after Christmas - so I missed out on my turkey! After leaving school, I went to college to train to become a beauty therapist, despite hating feet. I (somehow) managed pedicures but soon scarpered when it came to the waxing module. I have no middle name. As a kid, I always felt I was missing out. My girls have middle names. The first film I saw at the cinema was The Little Mermaid. I watched it with my mum, grandma and one of my brothers. During the summer holidays when I was seven, I broke my ankle. This didn't stop me playing out with my friends once I discovered I could walk on my cast. I used to leave my crutches at the front door and hobble out into the street to play marbles. My mum had to then take me back to the hospital to get my cast reinforced as it cracked and crumble underneath my foot. I could never be a vegetarian - I like meat WAY too much! I don't have a middle name either, and I always felt left out too lol. I like meat too much too so it was a struggle! I have no idea how I did it for so long. Thank u for the award, and congrats. I am not a fan of feet either. I get jittery if someone is near me with bare feet.